Do you make this mistake in predicting NFL games? After last weekend’s Division round of playoff games, former Super Bowl winning coach Brian Billick proclaimed rushing the ball still matters in the NFL. Who could disagree after those 4 games? New England ran for a startling 234 yards against Indianapolis, as LeGarrette Blount ripped off a 73 yard touchdown run to seal the game. Seattle rushed for 174 yards against New Orleans, as Marshawn Lynch again terrorized the Saints defense in the playoffs. San Francisco and Denver, the other two winners, also rushed for 100 yards while their opponents didn’t. However, as a smart sports fan, you know better than to draw conclusions after 4 playoff games. The sample size is too small. Moreover, rush yards per game is a misleading statistic. New England ran the ball 46 times in amassing 234 yards. It’s better to consider yards per carry in judging how well a team runs the ball or stops the run. In a previous article, I looked at the pass and rush efficiencies for 10 years of NFL playoff teams. To capture team strength in these two areas, efficiency is defined as yards gained per attempt on offense minus yards allowed per attempt on defense. The visual shows regular season numbers for NFL playoff teams from 2003 through 2012. For rush efficiency, the visual shows NFL playoff teams as a random selection of positive and negative values. 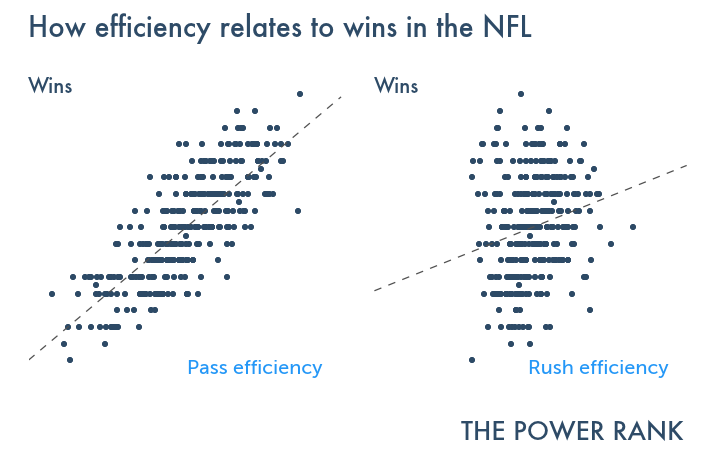 Unlike college football, rush efficiency has almost no correlation with winning in the NFL. Moreover, teams with high rush efficiency do not play better in the playoffs once they get there. Almost half of the teams that played in the Super Bowl gave up more yards per carry than they gained. Passing is a different story. Most NFL playoff teams had a positive pass efficiency, and 8 of 10 Super Bowl champions had some of the top values in the NFL. Did these trends hold up in the 2013 season? Here are the same rush efficiencies for the 2013 season. Playoff teams are highlighted by links that take you to their team page at The Power Rank. 5 of 12 of the playoff teams, led by New Orleans at 31st, appear in the bottom half of these rankings. The top 5 includes Minnesota, Washington and Oakland, teams that gave their fans major indigestion this season. Here are the numbers for pass efficiency. Of the 12 playoff teams, only Kansas City and Indianapolis do not rank in the top half for pass efficiency. All but two of the top 10, Arizona and Pittsburgh, made the playoffs. Passing dominates the NFL. Rushing hardly matters. How will this impact this weekend’s championship games? New England travels to Denver as a 6 point underdog in the AFC championship game. Vegas doesn’t believe in this Peyton Manning will choke in the playoffs stuff. Does New England have a chance? I think so. Let me explain. In their regular season meeting in New England, Bill Belichick played a defense geared towards stopping Denver’s aerial attack. Even when down 24 points at one point in the game, Belichick only had 6 defenders in the box to defend the run. Instead, New England played 5 defensive backs, two further than 10 yards from the line of scrimmage at the beginning of the play. Against this defense, Denver ran the ball 48 times for absurd 5.83 yards per carry (NFL teams have averaged 4.1 yards over the last 10 years). Manning only threw for 3.47 yards per attempt on 38 pass plays. It’s difficult to say that Belichick’s defensive plan won the game for New England. There were so many turnovers and fluky plays on both sides that finally allowed New England to win in overtime. But New England’s defense did shut down Denver’s passing attack. From watching the game, New England’s secondary had an amazing game, especially CB Aqib Talib on WR Demaryius Thomas. It’s unlikely they’ll play that well again. I give Denver 67% chance to win this game. Before the 2011 season, San Francisco had a weak pass defense. They fixed this by signing CB Carlos Rodgers as a free agent and drafting pass rush LB Aldon Smith. In the 3 last years, San Francisco has been a top 10 pass defense by yards allowed per attempt. However, Rogers missed the last two playoff games with a hamstring injury. San Francisco’s defense held up in the cold of Green Bay, holding QB Aaron Rodgers to 5.23 yards per attempt, less than the league average of 6.1. However, Carolina QB Cam Newton threw for 7.73 yards per attempt last weekend. If Rogers can be effective coming off an injury, San Francisco has a much better chance to contain Seattle’s offense. However, the numbers suggest a win for Seattle, probably by 5 points. When running backs such as LeGarrette Blount and Marshawn Lynch run for so many yards, it’s easy to get fooled into thinking rushing matters in winning playoff games. But the numbers simply do not support that claim. To think about this another way, New England rushed for 5.09 yards per carry, which includes Blount’s 73 yard touch down run. NFL teams average 6.1 yards per pass attempt, including lost yards on sacks. This doesn’t mean that rushing has no place in the NFL. Deception is a key factor in sports, and I believe run plays can set up play action fakes that result in long pass completions. But do yourself a favor. Don’t look at rushing numbers like yards per carry when making NFL predictions. Instead, focus on passing numbers. For more, click here. Before the Super Bowl, Bill Belichick told his Giants defense to let Thurman Thomas rush for 100 yards. As David Halberstam writes in Education of a Coach, it was a tough sell before the 1991 Super Bowl against Buffalo. The New York Giants played a physical defense that prided itself on not allowing 100 yard rushers. Just in case his players didn’t listen, Belichick took it upon himself to ensure Thomas got his yards. He took out a defensive lineman and linebacker and replaced these large bodies with two defensive backs. In football lingo, the Giants played a 2-3-6 defense designed to struggle against the run. 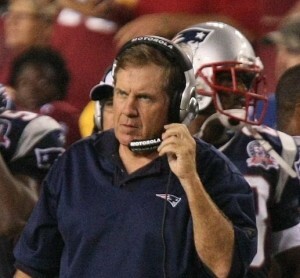 Did Bill Belichick go insane? I certainly thought so when I first read this story years ago. However, analytics is on Belichick’s side. Let me explain. When it comes to winning in the NFL, passing is king. Rushing hardly matters. To quantify this, our football obsessed culture must look past misleading statistics such as rush yards per game. Teams with the lead run the ball to take time off the clock. Any team can rush for 100 yards if they run it 50 times. To measure true skill, it is better to look at efficiency metrics like yards per attempt. A team can’t fake their way to 5 yards per carry by running the ball more. Here, efficiency for passing and rushing is defined as yards gained per attempt on offense minus yards allowed per attempt on defense. Higher values indicate more team strength. Sacks count as pass attempts, and these negative yards lower pass efficiency on offense. The visual shows the pass and rush efficiency during the regular season for all NFL playoff teams from 2003 through 2012. From the left panel, playoff teams excel in passing, both throwing the ball on offense and preventing the pass on defense. Only 15 of 120 playoff teams in this era allowed more yards per pass attempt than they gained. The visual also highlights teams that played in the Super Bowl. Eight of the ten Super Bowl champions were among the NFL’s elite in pass efficiency. However, excellence in the air does not guarantee playoff success. The New York Giants in 2007 and Baltimore in 2012 won the Super Bowl despite subpar pass efficiency. While the importance of passing in the NFL will not surprise anyone, the insignificance of rushing might. The visual for rush efficiency shows playoff teams as a random scatter of positive and negative values for their regular season statistics. A strong run game on offense and defense does not help a team make the playoffs. Moreover, teams with a high rush efficiency do not suddenly become clutch in the playoffs. Almost half of the teams that played in the Super Bowl allowed more yards per carry than they gained. In 2006, Indianapolis won the Super Bowl while having the worst rush efficiency in the NFL. Green Bay in 2010 and the New York Giants in 2011 weren’t much better. Running the ball does not affect winning as much as you think. To illustrate this point, consider this guessing game. Suppose you want to guess how many games a team will win during the regular season. Without any other data, it makes sense to guess 8, the average number of wins in a 16 game season. From 2003 through 2012, this estimate would be wrong by 3.1 wins. In technical jargon, 3.1 is the standard deviation of actual wins from the guess of 8. In normal people language, it says 2 of 3 teams will be within 3.1 wins of the guess. About two thirds of NFL teams won between 5 and 11 games between 2003 and 2012. With the rush efficiency for each team, how much better does your guess get? 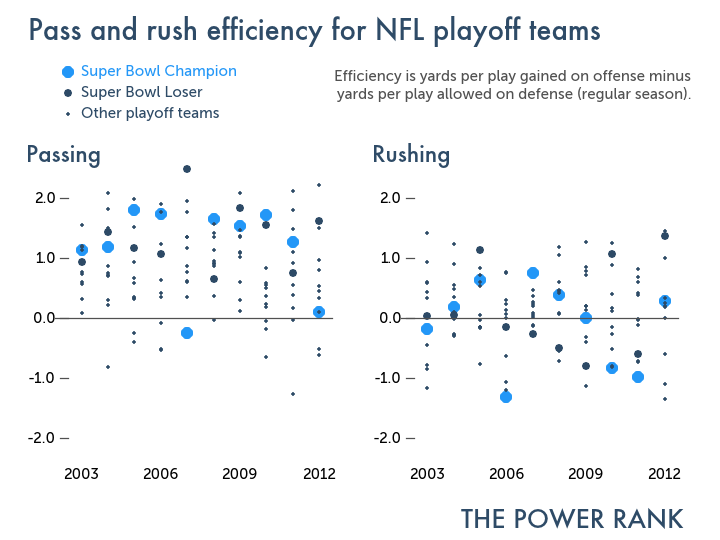 The right panel of the visual below shows how rush efficiency relates to wins for every NFL team from 2003 through 2012. Simple linear regression gives the best fit line through the data. The regression line gives a new guess about the number of games a team will win. For example, suppose a team has a rush efficiency of 0.6 yards per carry. Instead of guessing 8 wins for this team, the line gives 8.7 wins for this team. How much better are these new guesses? Not much. The error only drops from 3.1 wins to 3.03 wins. In technical jargon, rush efficiency explains only 4.4% of the variance in wins. You might as well guess randomly. The results get better using pass efficiency, as shown in the left panel. The error in estimating wins drops from 3.1 to 1.96. Pass efficiency explains 62% of the variance in wins in the NFL. The strong relationship is clear from the visual. In college football, rush efficiency correlates more strongly with wins than in the NFL. Teams like Alabama, Stanford and Wisconsin have won with a power running game and a physical front seven on defense. The insignificance of running the ball is unique to the NFL. 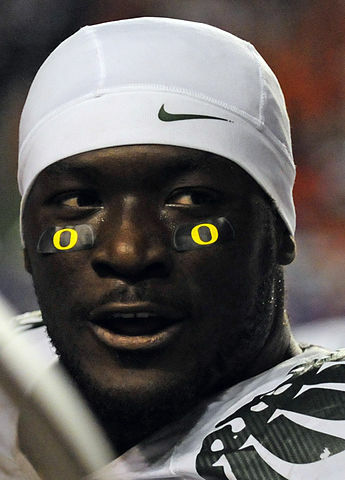 Analytics gives a broad view of how passing and rushing affect winning. But to dig deeper, let’s look at specific teams and their strengths in these areas. Under the leadership of GM Bill Polian and QB Peyton Manning, the Colts had a remarkable run from 2003 through 2010. They won at least 12 games each year before slacking off with 10 wins in 2010. They achieved success through the air, ranking in the top 8 in pass efficiency each year. Peyton Manning and his offense played the bigger role, but the pass defense helped out some years. The Colts ranked in the top 10 in pass defense (yards allowed per attempt) from 2007 through 2009. However, Indianapolis was really bad in the run game. Only once in this era (2007) did they gain more yards per carry than they allowed. As mentioned before, they were dead last in the NFL in rush efficiency in 2006 when they beat Chicago in the Super Bowl. New England won 125 games, 2 Super Bowls and played in 2 others during the 10 seasons covered by the visual. They followed the same script as Indianapolis: strong in passing, weak in rushing. From 2003 through 2012, New England ranked in the top 10 in pass efficiency in each year except 2008 and 2012. In 2008, QB Tom Brady got hurt in the first game of the season. New England ended the season 13th in yards gained per pass attempt and did not make the playoffs, the only time this happened during these 10 years. However, New England has never cracked the top 10 in rush efficiency. Coach Bill Belichick might not have seen the data presented here, but he gets the futility of rushing in the NFL. This understanding extends as far back as his days as defensive coordinator for the Giants. Indianapolis and New England have built their teams around passing at the expense of rushing. They, along with New Orleans of recent seasons, have had success in winning games and Super Bowls. Now let’s look at teams that excel at rushing. More than any other team, the Vikings dominate the ground game. They feature RB Adrian Peterson on offense and have tackles Pat and Kevin Williams clogging up the middle on defense. For the 6 years between 2007 and 2012, Minnesota has finished 1st in rush efficiency 4 of those years. However, this strength has led to ups and downs in wins. Minnesota went 3-13 in 2011 despite leading the NFL in rush efficiency. The next season, they led the NFL again behind a monster season from Peterson, who made a remarkable return from knee surgery. The Vikings had 10-6 record that season. The Viking’s best season over this stretch came in 2009. They finished 12th in rush efficiency that season. The difference? A QB named Brett Farve came out of retirement to play for Minnesota. The Vikings finished 7th in yards gained per pass attempt. They went 12-4 and came within a late turnover against New Orleans of playing in the Super Bowl. The Niners started winning games when coach Jim Harbaugh became coach in 2011. However, they had their strengths before he arrived. Behind DE Justin Smith and LB Patrick Willis, San Francisco had an elite run defense. From 2007 through 2012, they never finished worse than 8th in yards allowed per carry. This run defense didn’t help them win much the first 4 seasons, as the Niners won only 26 games. The pass defense never finished better than 15th during this time. When Harbaugh arrived in 2011, San Francisco drafted LB Aldon Smith, a pass rush monster out of Missouri. They also signed CB Carlos Rogers, who had his first Pro Bowl season in 2011. The Niners have finished 9th and 3rd in pass defense in 2011 and 2012 respectively. This resulted in 24 wins during these two seasons. In Super Bowl XXV, Bill Belichick’s plan to let Thurman Thomas rush for 100 yards worked, maybe too well. Against a small defense designed to slow down the pass, Thomas ran for 135 yards on 15 carries, a staggering 9 yards per carry. In the second half, he broke off a 31 yard run for a touchdown. The game ended when Bills kicker Scott Norwood sent a field goal attempt wide right. The Giants won the Super Bowl 20-19. The Giants did not win the game solely because of Belichick’s defensive plan. The offense generated two long scoring drives in the second half that took time off the clock. And I would bet my life savings Belichick did not want his defense to allow that 31 yard touchdown run to Thomas. But, as Halberstam discusses in Education of a Coach, Belichick did want the Bills to pick up small gains on the ground if it meant keeping Jim Kelly from throwing the ball. He understood that rushing means almost nothing to winning in the NFL. If you’re going to remember anything from this article, it should be this: look at a team’s passing instead of rushing numbers to determine whether they will win games. Earlier this week, Chris Harry at SI.com wrote an article on the art of forcing fumbles. Defenders, such as Charles Tillman of the Chicago Bears, “have used running backs, wideouts and tight ends as their personal canvases to become Picassos when it comes to getting the football on the ground.” The article’s timing was impeccable after San Francisco’s Kyle Williams fumbled two punt returns in an overtime loss to the New York Giants in the NFC Championship game. But numbers just don’t support the argument that a defense can force fumbles. Bill Barnwell at Grantland found a weak correlation between turnovers in the first 5 games and the last 11 games of an NFL season. (The study found a correlation coefficient r=0.14 over a sample of over 600 NFL teams over 21 years.) Harry actually offers us more evidence. He states that Tillman forced a career high 6 fumbles in 2009. Since the Bears faced 1033 plays that season, he had a forced fumble rate of 0.6%. Not a Picasso level of forcing fumbles in my mind. Have any thoughts? Think that someone needs to do a player based analysis on forcing fumbles? Leave us a comment please. Note: Sports Reference claims that Tillman forced 6 turnovers in 2009, with 2 interceptions and 4 forced fumbles. It’s not clear whether Chicago recovered any of those fumbles. And, of course, Tillman probably didn’t play in every play in 2009. And he wasn’t near the ball on every play. But the picture is clear: his forced fumble rate was low even in his best year. For more content, find The Power Rank on Twitter. —Can a defense force turnovers? —The Power Rank featured on KALX Spectrum, the science and technology show on UC Berkeley student radio. It’s not whether you win or lose, but how you play the game. Most people agree that this old adage belongs on a Pop Warner youth league field, but many would say that it really has no place in the results oriented win-at-all-costs culture of the NFL. The Power Rank seeks to change this paradigm by examining not just how the teams have fared in the win and loss columns, but also examines the margin of victory used to dispatch their opponents. For example, lets take a look at two of 2011’s 4-1 Cinderellas – San Francisco (#8, 2.33) and Buffalo (#12, 1.31). Both teams started the season in a bit of a hole, as The Power Rank accounts for last season’s ranking during the beginning of the year. At the end of last season both teams were in the cellar – Buffalo at #27 with a -3.80 rating and San Francisco at #28 with a -4.37 rating. Ouch. This poses a bit of a question though, how did the 49ers leapfrog the Bills and climb out of a bigger hole faster and end up farther? The answer is the strength of their wins. Their schedule includes two The Power Rank top ten teams, including the #1 Patriots. For an algorithm that gives credit for strength of schedule, that win alone should have been solid gold. So what does our algorithm see in a 49ers squad whose best win was against #16 Cincinnati, over a Buffalo team that shocked #1 New England and #7 Oakland? The first answer lies in the blowouts. In week one Buffalo surprised us by beating the 2010 AFC West champion Chiefs, and really caught our attention by doing so by burying them with a 41-7 final. At the time this win made the world seem upside down, yet in hindsight the Chiefs are barely a shell of who they were last season, as their current #30 rank suggests. In short, most teams in the NFL should have beaten the Chiefs by a wide margin in week 1. San Francisco’s blowout came just this last week against the Bucs in a 48-3 game. I suppose the best way to prevent Josh Freeman from creating another great come from behind victory is to make sure his team is down by five touchdowns. The margin of victory is similar to Buffalo’s win over Kansas City, but earning that margin against an otherwise 3-1 team that is at worst an average team makes the win far more impressive. While both teams have had a major blowout and a few close ones, other than the Chiefs the Bills have not been able to beat an opponent by more than one score. On the other hand the 49ers have two solid wins under their belt. First was the beatdown of Tampa Bay, and the second was a comfortable 16 point margin of victory over Seattle. Good teams win. Great teams never let their victory come into question, and The Power Rank’s algorithm naturally accounts for this distinction. The second reason why the Bills were lapped by the 49ers is all about the Bengals. Both teams faced the Bengals in Cincinnati this year but the outcomes were slightly different. The Bengals account for the Bills lone loss, but the 49ers were able to put them away on the road. The only other common opponent so far this year was Philadelphia, and both teams were able to beat the struggling Eagles. The Power Rank’s algorithm gave Cincinnati credit for beating the Bills, and then gave the 49ers credit for beating a team that beat the Bills. Without more common opponents to compare this early in the season, this football food chain helped slingshot San Francisco into the top ten this week while leaving the Bills behind – because as far as we are concerned, how a team gets a win is more important than the win itself.